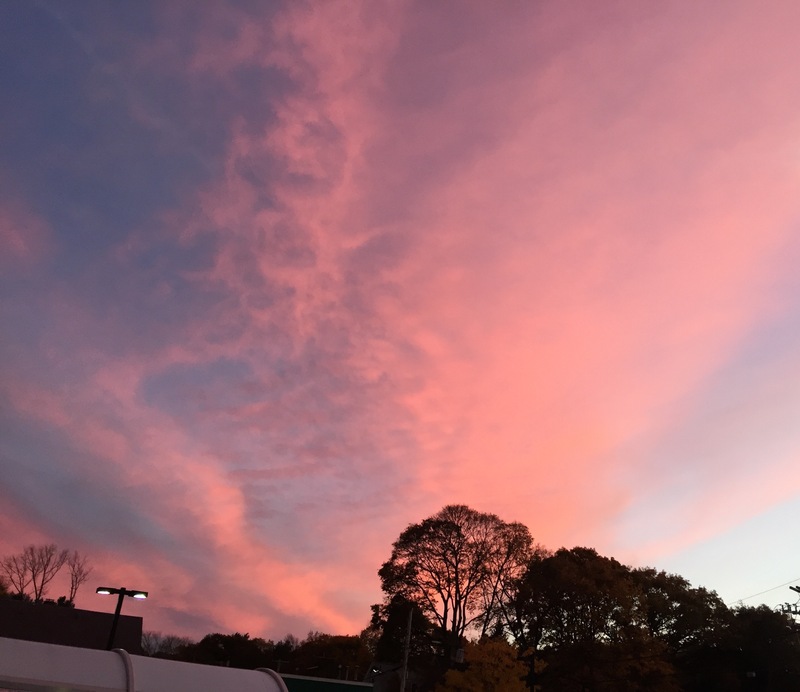 Sun in ascension, food shopping behind me as I step out into dusk light, strands of rose-colored clouds stream the blue sky. I go to my car, store my bags, grab my smart phone. Energized with delight, I run the parking lot, hoping to capture the rosy images, this unexpected moment of beauty. The timing — the day before we set the cloaks back an hour, propels my effort. This could be the last late-hour sunset I catch until spring. Like the butterflies drawn to Buddleia blooms, I am drawn to bright light. On spring and summer days, I raise the shades greedy for each new spring arrival. I note the tone and texture of the sky, the morning doves rustling in the evergreens along the driveway, the first spurt of ferns in emergence. Spring light makes me giddy. I sleep less; my mood is high. By August, the shade hovers over a third of the garden as the sun’s angle shifts downward. I rail at friends who declare that August’s arrival marks summer’s end, grateful for how the sun’s flame sustains the crème lilies, mauve phlox and red zinnias. Plants and I have much in common. I also wane in low light. By mid-September, I start each day with a dose of my natural spectrum “happy light.” I liken its effect to the one-a-day iron pill my physician prescribed in my thirties. A daily flip of the switch fortifies my energy, keeps me focused and able to thrive during dark days. A born and bred New Englander, I’m wedded to the unpredictable variety of seasons, the pleasure of newness. I recall my first winter trip west, a visit with my first cousin, Paul. We were in his Walnut Creek garden filled with wide-mouthed poppies, the whirr of humming birds, a profusion of azalea shrubs in bloom. The sky was flawless, the sun high. “I miss the clouds. Don’t you get bored with the endless blue sky?” I asked. “Not when I consider the option of endless gray skies in winter,” he retorted. He had a point, I concede. There is no perfection, only choices and what we make of them. During my busy life as a mother and full time therapist, winter and grey skies were challenges to manage. As I aged, I became more aware of the effect of light on my well-being, how quite without warning, shorter, shadowy days leached my energy and triggered irritability. I’m grateful for the lessons learned in my psychotherapy practice. I’m thankful to Lois, a colleague who introduced me to light therapy and instructed me in its safe use. I shared the benefit of my experience with clients who bought those early clunky models and received the equivalence of the sun’s rays all winter long. There are gifts from the universe, like rosy streaks at dusk infusing the spirit that make a difference. This entry was posted in Happiness, Mindfulness, Nature, Well-Being and tagged light therapy, mindfulness, short days, well-being on December 7, 2015 by fayewriter. Beautiful, a pleasure to read. Thank you, Andrea. Much appreciated! Faye I am taken with your sensitivity to nature, the outside world in general. You see and feel so much. I like the way you drift into brief reminiscence. Nive to connect the now and the then and its evocation of gratitude. Hy, yes, I find the opportunity for much gratitude in the everyday and memory. Thanks for subscribing!